Viona-art.com is my new favorite photography website. These folks are lovely. Their designs and layouts are fantastical and breathtaking. Their costumes are inspirational. Their backgrounds are amazingly ornate. The models beautiful, without being plastic. They also host several events throughout the year, OOOhhhh a girl can dream, can’t she? too bad it’s half a world away. If you have not been to their website, you are missing out on some fantastic eyecandy. 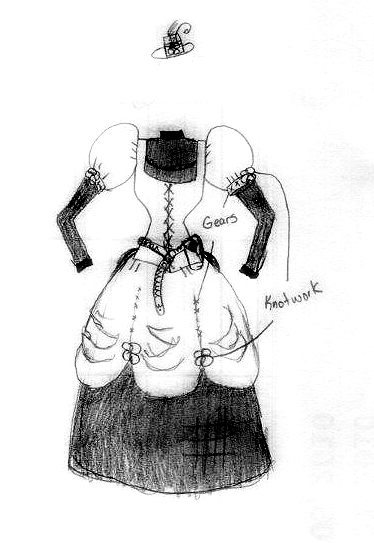 Here is the current sketch-up of my dream steampunk costume. THIS is the hat that I used to base this costume off of. I’m still debating about the corset, I am not sure if I want it to be overbust or under, and if I want straps with it or not. The dark fabric is the same fabric as the plaid on the hat, the knotwork is the same as the hat as well. I very much dislike the belt, but didn’t feel like erasing it. And yes, there is a bustle on the back. There will be more sketches to come. Sorry it took so long to get it up, I had my husband scan it for me…and then forgot to post it.